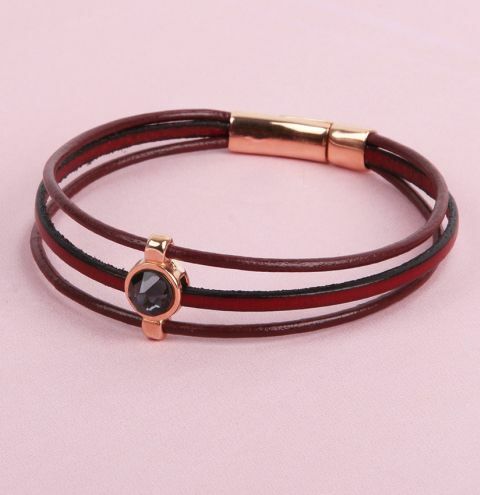 Make a delicate leather bracelet with a sparkling Swarovski crsytal at the centre. Measure how long you want your bracelet to be. Make your cord a little longer than you may need so you can adjust to the right length before gluing on your clasp. When you have decided on the length, cut 2 lengths of 2mm round leather cord and 1 length of flat leather cord. Thread your 3 hole slider bead onto all of the cords. The round leather cords should thread through the outer holes, the flat leather cord should thread through the middle. Pay attention to the way the cord is curving, you will need to match this with your curved clasp and make sure that the patterned side of the 3 hole slider is on the inside of the bracelet where it will sit against your skin. The flat pad on the other side is where you will glue your crystal. Slot the end of your cords into each end of the clasp to check that it is the correct length. Trim a little off if you need to. Glue one end of the 3 cords into one side of the clasp. Make sure the flat leather cord is in the centre when it is glued. Check the cord length again and glue the other side into the other end of the clasp. About 2 or 3 drops of glue will be enough. Add a little more to soak into the leather if you need. Finally add a drop of glue onto the pad on your connector charm and secure one of your Swarovski crystal flat backs here.